The NY Times Spoiled Batman Issue 50 Wedding? Will Sales Be Hurt? The New York Times Spoiled the Batman and Catwoman Wedding! Will Sales Be Lost? Fans have been waiting for months to know if Bruce and Selina will say “I do” on July 4, 2018 in Batman Issue 50. However, The New York Times has gone ahead to give us a very spoiler-heavy answer. Will the reaction from certain fans affect sales? Batman Issue 50 spoilers ahead! You have been warned! Meow! Batman and Catwoman are one of my top OTPs (One True Pairings) when it comes to fictional characters. For me, they are each other’s true love even if they are together or not. That’s why I was excited to see writer Tom King working toward Bruce and Selina marrying each other in his Batman comic book run. Now, take note it wasn’t going to be an official wedding because Bruce Wayne legally marrying known criminal Selina Kyle doesn’t sound right. But you know what? The shipper in me was content with a fake wedding. DC Comics even released numerous tie-ins to the upcoming wedding ceremony. Selina even had a conversation with Damian about how the Bat Family will be affected if she married his father. That’s why the reveal about even the fake wedding not happening has disappointed me. According to The NY Times, it seems Selina will decide not to come to the altar because she thinks marrying Bruce will stop him from becoming Batman. Apparently, a happy Bruce Wayne equals an inefficient Batman; something the Joker told Selina back in Batman Issue 49. I mean, Selina’s thoughts do make sense. The Mary Sue even wrote a piece about how Selina deserves better than Bruce. The Caped Crusader is still a child, suffering from a traumatic past. 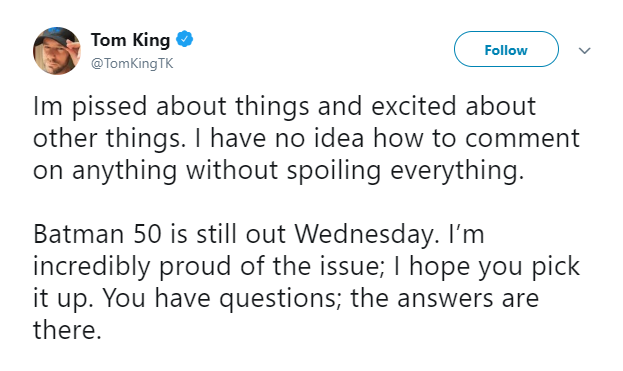 And I guess Tom King didn’t want to use the wedding as a way to help Bruce grow as a character. 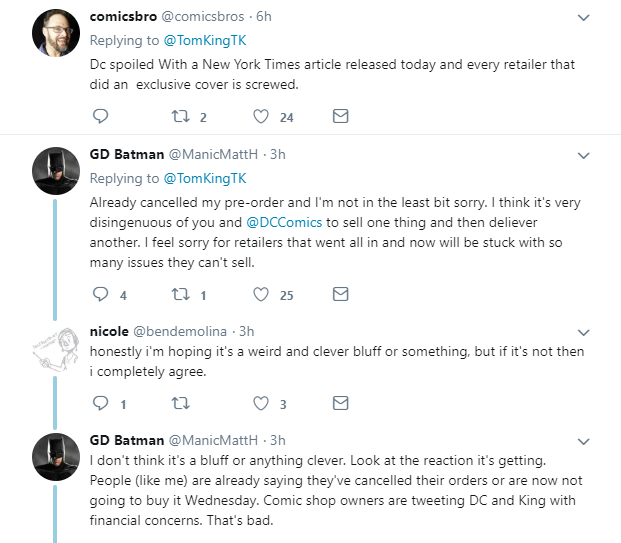 Some fans are clearly disappointed by the news, even going as far as canceling their orders for Batman Issue 50 and the numerous variant covers. They were invested in the wedding. But now that the Bat and the Cat won’t be getting married, they feel cheated. It is as if the entire thing was a way to make them spend money for months on something that wasn’t meant to be. It is kind of surprising how DC Comics decided to spoil such a huge reveal. I wonder what DC Comics was thinking. Maybe the publishing juggernaut didn’t want fans to get their hopes too high? Such a move, as far as I can tell, is going to affect sales. In contrast, Marvel also promoted the wedding between Kitty Pryde and Peter in X-Men Gold. And while the two mutants didn’t marry, fans still got to see Gambit and Rogue wed each other. Furthermore, the buildup to the wedding in X-Men Gold also didn’t have a ton of tie-in issues (like Batman) to make more money. That’s why even if fans didn’t get the wedding which was being talked about, they didn’t feel too bad about it. 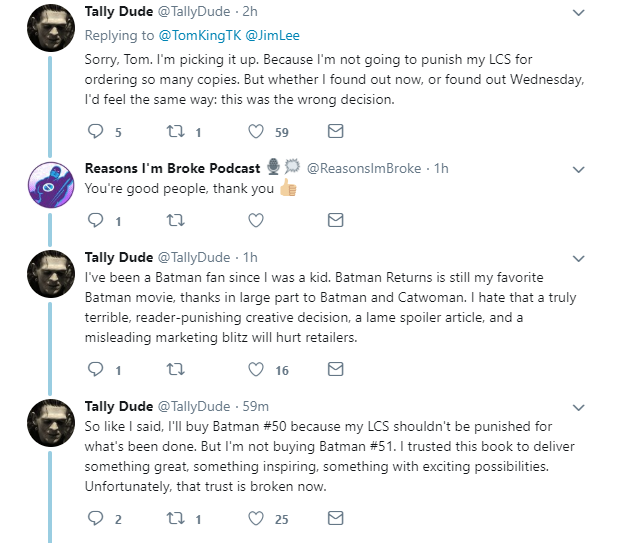 Tom King’s Batman run is a different story. It was just hype and buildup for nothing. Did you want Bruce and Selina to get married? Feel free to share your thoughts about the Batman Issue 50 spoilers with us. Previous:RuPaul’s Drag Race Season 10 Becomes Highest-Rated Ever! Now Let’s Do Something About Racism!